The Short Circuit report, released by our international partner The Gaia Foundation in April 2013, exposes the true social and ecological costs and toxic legacy of gadgets such as smartphones and laptops. From the environmental destruction and contamination caused by extraction, exploitative working conditions during production, to the mountains of e-waste being shipped abroad, the report follows the birth, life and death of everyday gadgets and reveals their true cost to the planet and to future generations. 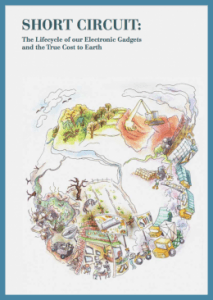 Short Circuit is the follow-up to our 2012 report, Opening Pandora’s Box, which exposed the alarming scale and rate of growth of the extractive industries and the disastrous ecological impact that this is having across the world. Short Circuit turns our attention to a key driver of this growth – the surge in consumerism and growth of a throw-away culture, fuelled by marketing and delusions of necessity, and supported by the obsolescence built into our electronic gadgets. ‘Short Circuit’ shows that our myriad electronic gadgets, (and the system that creates them), are stimulating the growing demand for metal and mineral extraction. It invites us to reassess and become conscious of what we really value in life, and to become part of a critical mass for change.